Emerson staff employees and union members Richelle Devereaux-Murray and Dennis Levine protested outside the Dining Center in October. John-Albert Moseley makes less than $50,000 a year. He used to live in Dorchester, but he and his husband were forced to move to Providence, Rhode Island because they could no longer afford to remain in Boston. Moseley’s husband receives disability payments, and this month, the two qualified for food stamps. Moseley is the program coordinator for the visual and media arts department at Emerson College. “It’s kind of an embarrassment for Emerson [that] full time employees have to rely on welfare,” he said. Moseley is on the bargaining committee for Emerson’s chapter of Service Employees International Union Local 888, a union that represents around 140 college staff members. College representatives and the committee are set to meet for another round of contract negotiations today. Ron Patenaude, an organizer for the union, said there have been at least 20 negotiations in a period spanning more than a year. The last meeting was Oct. 27—a week after union members protested low wages and poor working conditions outside the Dining Center. There are 11 pay grades listed on the Human Resources staff compensation section of the college’s website—12 to 21. Pay ranges from a minimum of $24,000 for a Grade 12 employee to $215,800 for a Grade 21 employee. Grade 12 is described as an entry-level support position in the Emerson Job Description Matrix, while Grade 21 is described as an executive position. A 990 tax form filed by the college showed some vice presidents in the administrative departments made between $200,000 and $300,000 in the 2015-2016 fiscal year. The same document showed President M. Lee Pelton made at least $720,903. Information gathered by the U.S. Census Bureau showed the median gross rent in Boston between 2011 and 2015 was $1,320 a month, and the median household income was $55,777. 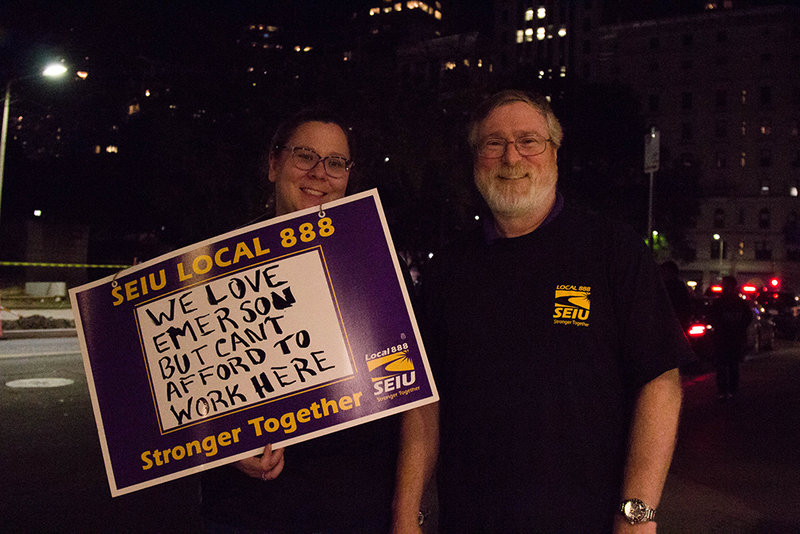 Ticktin is a Grade 13 employee and said Emerson pays her $46,079 a year—slightly above the maximum for her pay grade. She also works part time to supplement her salary. “There are people making less than me, and I don’t know how they get along,” she said. Ticktin is divorced and lives in a single-bedroom apartment with her 16-year-old son in Hyde Park. Ticktin said she sleeps on the couch so her son can have his privacy, and that her apartment is the best she can afford for the two of them on her salary. Institutions use number ranges, called percentiles, to compare how employees with similar positions working at different institutions are paid. In 2013, a compensation survey conducted by the college found 75 percent of employees at more than 30 peer schools are paid more than Emerson staff members in similar positions, putting college employees in the 25th percentile for wages. According to both the union and members of administration, the college has been hiring new employees at the 40th percentile—but there are current staff members paid below that rate. “We don’t understand why there’s money to hire… new people at [the 40th percentile], but not to bring up longtime staff who are in here, working, to the [40th percentile] now,” Ticktin said at a bargaining committee meeting. Senior Associate Vice President and Chief Human Resources Officer Shari Stier said the college has set aside funds to raise all of its staff members to the 40th percentile, and that some staff members are already at this rate or above it. “We should get pretty close to moving everyone… to the 40th percentile,” she said. During one of their meetings, union members on the bargaining committee said negotiations have been difficult at points. They said the college took three months to respond to one of their proposals, arrived to a negotiation without a counter proposal, and provided a counter proposal devoid of the annotations union members had made to the original copy. The college could not be reached for comment on these specific issues. SEIU Local 888 started representing college staff members in 2015, after employees expressed interest in organizing and sought representation from a union. Multiple bargaining committee members said one reason the union was formed was the inconsistent treatment employees received from Human Resources. “It’s like a different set of standards depending on where you work in the school,” Information Technology Project Manager Hugh Gilbert said at a bargaining committee meeting. Negotiations are still ongoing, and it is unclear when they will end.